With the numerous options available to store, protect and share data across a network, there are many considerations to make when selecting a storage server. Being that it is crucial to select a storage system that can grow with your data, and at the same time minimize downtime, one of the most important considerations is storage scalability. The SnapServer DX series introduces DynamicRAID, the industry’s most automated form of data protection and most non-disruptive form of storage scalability. during setup, even when the drives are of mismatched sizes. All drives present in the SnapServer DynamicRAID set will then contribute to a single, easy to manage storage pool. 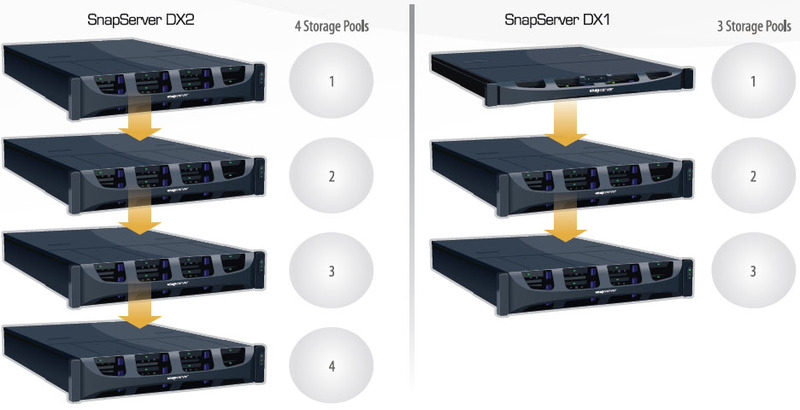 The SnapServer DX series uses LED indicators on the drive bays to notify the administrator when drives can be removed and replaced, thus reducing error when adding storage. As long as a drive LED displays a green light, the drive can be safely removed. Once a new drive is inserted, the GuardianOS will display that a new drive has been detected; and at that point, the drive can be added to the existing storage pool and will automatically grow the amount of available storage to all of the Dynamic Volumes. Although the RAID builds in the background, the new storage volume space is instantly available to network users. Administrators can add hard drives at any time as long as a SnapServer DX has empty chassis slots available. Once the GuardianOS detects the new drive, the administrator will have multiple options with which to handle the drive. The new capacity can be added to an existing storage pool to grow the current volumes; it can be used to migrate from single or dual parity DynamicRAID protection, or used to expand an existing snapshot volume. For adding storage beyond the SnapServer head unit, the SnapServer DX Series supports the attachment of the 2U, 12-bay SnapExpansion DX chassis. The expansion chassis are attached to the SnapServer using a 6Gb SFF-8088 SAS connection and are daisy-chained to one another when multiple expansion chassis are utilized. Each SnapExpansion contains its own DynamicRAID set with associated storage pool. 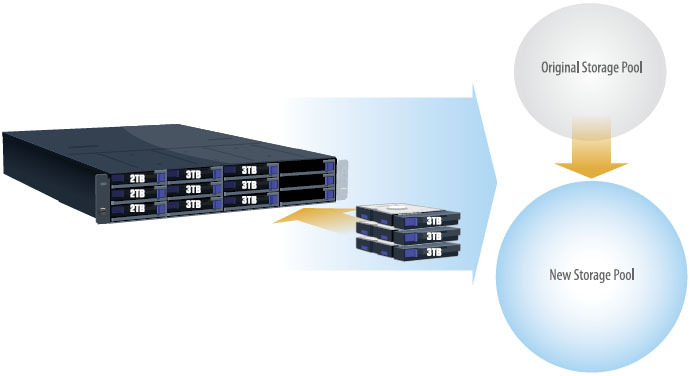 Although the storage pools and volumes cannot span between chassis for the purposes of performance and data protection, the SnapServer head unit will manage all of the storage under a single interface. The SnapServer DX1 supports up to three of the SnapExpansion DX units for a total of 40 drives and a maximum capacity of 120TB. When attaching the SnapExpansion DX to the DX1, the SAS HBA must also be installed to provide the SAS expansion port. The SnapServer DX2 includes the SAS HBA and supports up to seven expansion chassis for a total of 96 drives and 288TB. Protect your data with GuardianOS features such as snapshots, replication and DynamicRAID; and with multiple expansion options, the SnapServer DX allows you to pay as you grow and always have the right amount of storage for your environment.